The Amish Callahan Bar Stool couples handsome construction with delicate details that make this piece the perfect balance of sturdy and stylish. Handcrafted in 100% solid hardwood in a northern Indiana Amish wood shop, this bar stool features a gorgeous back splat that offers comfort and support. 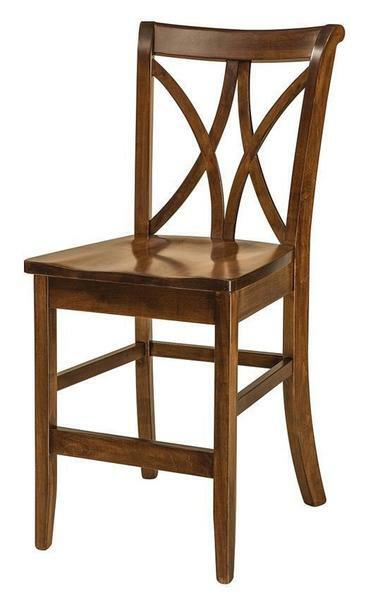 The Callahan contributes to your collection of french country style furniture with ease. All the beauty of southern France is represented in these custom made bar stools with their elegant arcs and gracefully curved legs. The Callahan is shown here in brown maple wood with nutmeg stain. Brown maple wood displays a dark stain exceptionally well and polishes handsomely to shine in your kitchen collection. Dine comfortably in your French country kitchen or consider these lovely seating options for your crafting room. View the matching Callahan Swivel Bar Stool as well as the Callahan Dining Chair for matching seating throughout your home. Feel free to give us a call at 866-272-6773 to speak with our Amish furniture specialists and learn more about your options. Thank you for shopping with DutchCrafters. Seat Height from Back: 18 1/2"